Our spacious 750 square foot King Luxury Suite features a dining area with leather chairs, a large private bedroom with a king bed and a living room complete with a wet bar, and espresso machine. 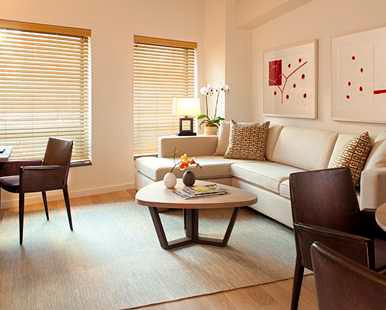 We will take in the views of beautiful Battery Park City below while enjoying amenities such as in-room wireless and wired internet, mini bar, full-length mirror, deluxe toiletries and two flat-screen televisions. This Luxury Suite also features a five-fixture bathroom with double vanity, full bathtub, and separate shower. Complete with Conrad Concierge service, our accommodation is everything we need to make our honeymoon relaxed and luxurious. Our King Premier Suite boasts 700 square feet of spacious comfort, complete with one king bed, a walk-in closet, and separate living room. We will take in the city view while enjoying the suite's sophisticated decor of lightwoods, contemporary artwork and frosted glass-sliding panels. This suite features a sectional living room sofa, two flat-screen televisions, wet bar with espresso machine and a coffee table consisting of prominent magazine publications and an Art Book depicting the work seen throughout the room and hotel. Upscale amenities include a soaking tub, separate rainfall shower, signature Serta-Conrad bed, mini bar, plush bathrobes and slippers and a spacious work desk. We will enjoy easy access to our own virtual concierge by way of Conrad Concierge, providing the ability to make dining reservations, order room service, request additional suite amenities and more via television, laptop, touch pad or Smartphone. What more could we want for our honeymoon? 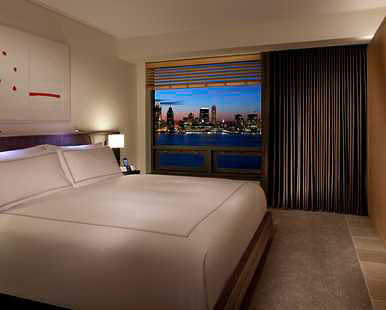 Located on the highest floor of the hotel with stunning views of the Hudson River, our 430 square foot King Superior River View Suite features one king bed in a spacious, private bedroom. Our living room is furnished with a sofa, work desk, wet bar with an espresso machine, full set of glassware and a second HDTV with plug-in ports for a vast array of electronics. The sophisticated decor in the suite boasts light wood, contemporary artwork and frosted glass-sliding panels, allowing for personalization of the suite. A rainfall shower, deluxe toiletries, full-length mirror, in-room wireless and wired internet, mini bar and one-touch integrated technology to control the suite's environment all contribute to Conrad New York’s definition of smart luxury. We will take in the beautiful views while staying in the ultimate luxury accommodation. Serving as a spacious retreat, our 750 square foot King Luxury Suite Mobility Accessible features a dining area with leather chairs, a large private bedroom with a king bed and a living room complete with a wet bar, espresso machine and sectional sofa. We will appreciate views of beautiful Battery Park City below, while enjoying amenities such as in-room wireless and wired internet, mini bar, full-length mirror, deluxe toiletries and two flat-screen televisions. 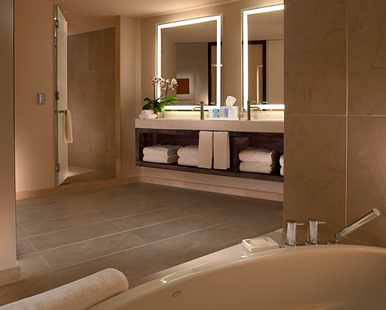 Our Luxury Suite also features a five-fixture bathroom with double vanity, full bathtub, and separate shower. 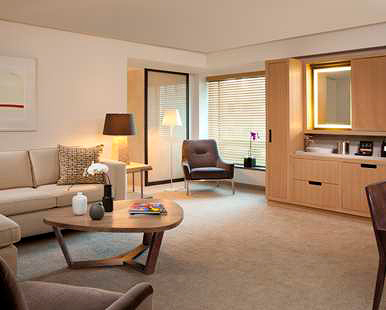 Tailored specifically to our mobility needs, this suite has all of the comforts of home and so much more. On our romantic honeymoon at Conrad New York we will experience pure luxury with room service for breakfast, lunch and dinner. We will choose from a menu featuring a variety of gourmet selections to make our honeymoon that much more memorable from the comfort of our room. Marrying old world respect for great food and flavors with a contemporary attitude toward style and service, ATRIO provides us with a modern Mediterranean experience that is authentic in every sense of the word. The all day menu offers us inventive flatbreads, roasted seasonal vegetables, unique meatballs, salads, artisanal cheeses and cured meats to share, and the wine list is impeccably vast and delicious. Whether we enjoy a well-crafted martini and a prime New York strip, a bay scallop risotto or roasted Branzino with parsnip puree, or any of Atrio's bar snacks, small plates, wines and signature cocktails, this restaurant is the perfect setting and dining experience for us on our honeymoon in New York. Perched atop of the new Conrad New York, the Loopy Doopy Bar is a seasonal destination with stunning views and a contemporary decor. This chic terrace bar features an array of cocktails, wines and more. We will unwind and toast to our new lives together as the sun begins to set over the twinkling lights of the city. 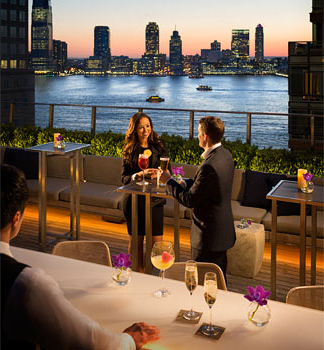 With your generous gift, we will experience the honeymoon of a lifetime at the Conrad New York. This hotel is a contemporary architectural landmark conveniently located downtown in the midst of thriving Lower Manhattan, steps from some of the city’s most iconic and historic landmarks and attractions. 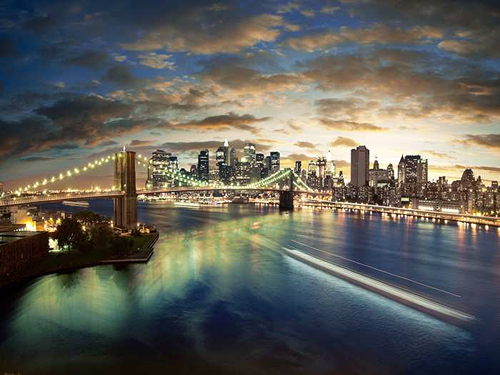 At night, we will stroll down busy sidewalks where the sights, sounds and personality of Manhattan come to life. 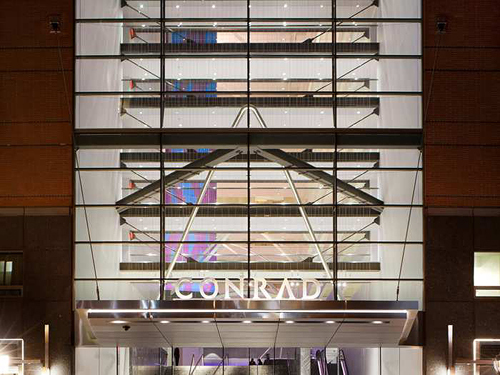 TriBeCa, SoHo, the Statue of Liberty and the National 9/11 Memorial, are all just minutes away, making the Conrad New York location ideal. From fine dining at ATRIO to working out at the state of the art fitness center, we will truly live in luxury at the Conrad New York. At the Conrad New York, we will admire the monumental art of Sol LeWitt in the atrium and taste the Mediterranean influences in dishes from Atrio. After shopping for New York gifts and luxury lifestyle goods at Accents New York, Bloom, Vintry Wines, Battery Place Market, or Artsee Eyewear, we will escape to The Loopy Doopy Bar, the Conrad New York’s seasonal rooftop bar, for a summer cocktail and a brilliant Hudson River vantage point. At night, we will enjoy the innovative cuisine at ATRIO Wine Bar | Restaurant. Working out in the 24-hour lobby level fitness center will be easy with the LifeFitness cardiovascular and strength training equipment. Your thoughtful contribution allows us to experience the best in New York living on our honeymoon. A bottle of our favorite wine will be delivered to our suite. We will make a toast to our romantic honeymoon in New York. A chilled bottle of Moët et Chandon paired with gourmet chocolate covered strawberries will be delivered to our suite. We will make a toast to our romantic honeymoon while enjoying our New York City honeymoon. This is the epitome of romance.